I thought I'd do a little series on settling into school, for all the little ones beginning school and for any anxious older ones. It is always comforting to know that others have gone before you, and have faced similar situations, regardless of whether you are a cat or a witch's child. In fact, sometimes the more fantastical the setting or character, the less 'preachy' or moralistic the story. 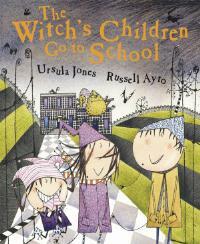 In this story,"The witch's children go to school" by Ursula Jones, the witch's children don't really go to school, but they meet Gemma who is about to have her first school day. But only if she is brave enough to move past the Class Three kids. The oldest child of the witch has an idea - and uses a spell to change Gemma into an ogre, "because ogres aren't scared of anyone." The fun begins now - all teachers, caretakers, students and animals are turned one by one into a storybook creature - so that Gemma the ogre does not feel so alone. The witch's children get a little carried away, and haven't learnt enough about spells to change anyone back. "Now we've got trouble," mewed the school cat. The only person who can help is Mum! So the witch's children summon Mum. And the Eldest One shouted, "I've lost my pants." "I can't find my dress," the Middle One wailed. And the Little One yelled, "Where are my socks?" Mum not only knows where the missing clothes are, but she knows how to turn the ogre, the storybook, the dancing princesses, the tiger, the swans, the gingerbread men and all the other storybook people back into students, teachers and the school cat. Russell Ayto's illustrations are hilarious - there are definitely no traditionally scary witchy figures here at all. 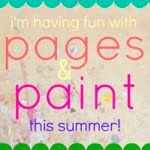 Lots of bright colours and active characters. My favourite double page spread is the one with the three open-mouthed children, shouting for Mum. It was a bit like that at 5.30pm in our house today!